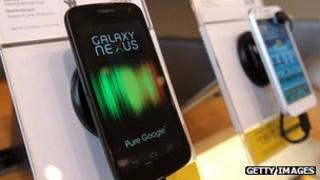 The US Court of Appeals has overturned a ban on sales of Samsung's Galaxy Nexus phone, in a blow to Apple in the ongoing battle between the two rivals. It said the district court in California, which had issued the ban in June, had "abused its discretion in entering an injunction". Earlier this month, a sales ban on Samsung's Galaxy Tab 10.1 tablet computer in the US was also lifted. The two firms are involved in a legal tussle over patent infringement claims. Samsung welcomed the latest decision saying it "confirms that the role of patent law is to protect innovation and not to unreasonably stifle competition and restrict consumer choice". "We will continue to take all appropriate measures to ensure the availability of our innovative products," the South Korean manufacturer said. The smartphone segment is one of the fastest growing sectors for phone manufacturers and Apple and Samsung are among the biggest players in the arena. Apple, which makes the iPhone, was one of the early pioneers in the segment, while Samsung, which manufactures the Galaxy range of smartphones, has made rapid strides in the sector gaining a strong share of key global markets in recent years. However, its success has coincided with a growing legal battle with Apple, spread across various countries. Earlier this year, a California court awarded Apple $1.05bn (£652m) in damages, after ruling several of its software and design technologies had been infringed by Samsung. Samsung has since challenged that verdict and called for a retrial. "The intensity of the competition is so high, that it is less about billions of dollars in fines but more about slowing the competition," Manoj Menon, managing director of Frost & Sullivan, told the BBC. "Apple will try and slow the rapid growth trajectory of Samsung," he said.